The instrument non-specific aspects of the Observing Tool (OT) are described elsewhere. Detailed information on NIRI Component of the OT and the NIRI Iterator is provided below. Choice of camera, beam splitter, filter, dispersing element and focal plane mask (slit) is made by clicking on the pull down lists (i.e. the down-pointing arrows) and selecting the desired item. For example, there are three cameras f/32, f/14 and f/6, which are normally used with the "same as camera" slitter or f/6 beam splitter. Note how the window displaying the science field of view changes automatically to reflect the choice of camera, focal plane mask, and beam splitter. For direct imaging no dispersing element is required. If you display a view of the field with the position editor and have selected the "science area" button, then this too will reflect the choices of NIRI camera and focal plane mask. 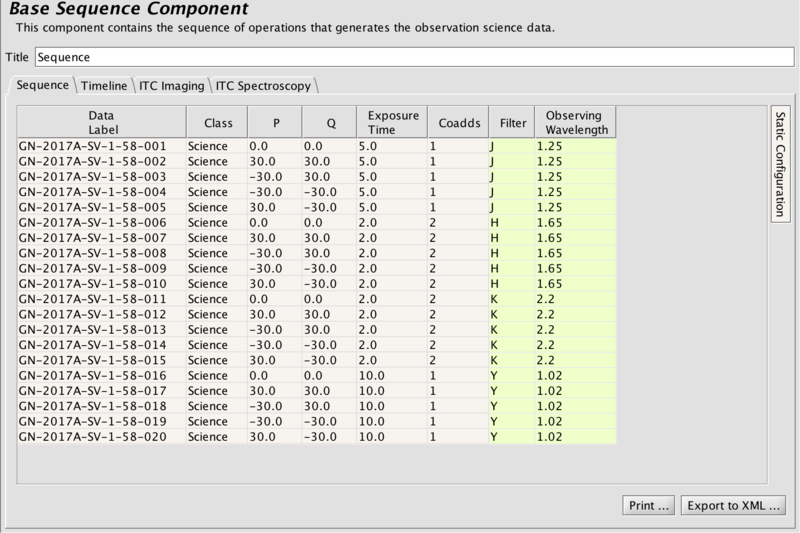 For imaging observations, the filter is chosen by selecting one from the list (by clicking on it). The central wavelength is given for each filter to assist with identification. You can move the vertical slider bar or click on the arrow buttons to browse the list. Note that the proper order-sorting filter should be selected for grism spectroscopic observations. The exposure time is set by clicking in the relevant window and typing the required number of seconds. Each occurrence of the observe element will cause N exposures to be taken and coadded in the instrument control system. The value of N is set by typing an integer in the "coadds" window. 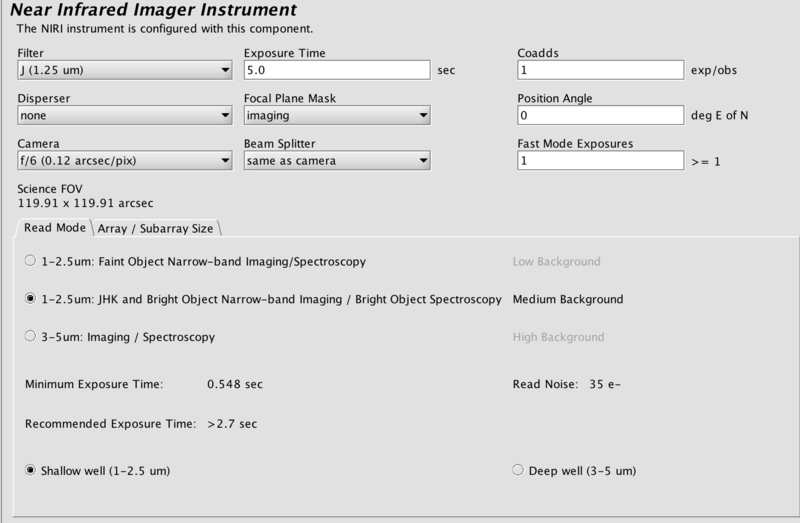 The total exposure in each output image will be the exposure times the number of coadds. The total exposure time (single exposure x coadds x nods) in a single observation should not exceed 4 hours for imaging. The facility Cassegrain Rotator can rotate the instrument to any desired angle. The angle (in conventional astronomical notation of degrees east of north) is set by typing in the "position angle" window. The view of the science field in the position editor will reflect the selected angle. Alternatively the angle may be set or adjusted in the position editor itself by interactively rotating the science field. The NIRI array is read out in different modes for different kinds of observations. Select the button corresponding to the desired mode. Note that the read noise, recommended minimum exposure time, and suggested background regime are indicated in green to the left and below; they change as the different read modes are selected. The array bias voltage can also be set for "deep well" and "shallow well." The choice of bias voltage affects the well depth, but not the minimum integration time or read noise. Note that the array read mode can be changed in the NIRI iterator, but the bias voltage cannot. A smaller sub-array can be read out more quickly than the whole NIRI array. By clicking on the "Regions of Interest" tab, one sees the options available: full frame readout (1024x1024 pixels), central 768x768, central 512x512, or central 256x256. As implied by their description, each subarray is centered on the detector. The sub-array readout should be used to reduce the minimum integration time. Note that the subarray size can be changed in the NIRI iterator by selecting "Builtin ROI" from the Available Items. Any changes made in the OT are stored locally. These do not get sent to the Gemini online database unless the program is synced. The sync button (on the top right of the OT) accepts the latest changes and stores the newly updated program to the Gemiini database. You can also export your program locally to an XML file through File-->Export as XML which can be later imported back into the OT if needed. The items that are available for inclusion in the iterator table are shown in the box in the upper right-hand corner. Selecting one of these items moves it into the table in its own column. Each cell of the table is selectable. The selected cell is highlighted green. 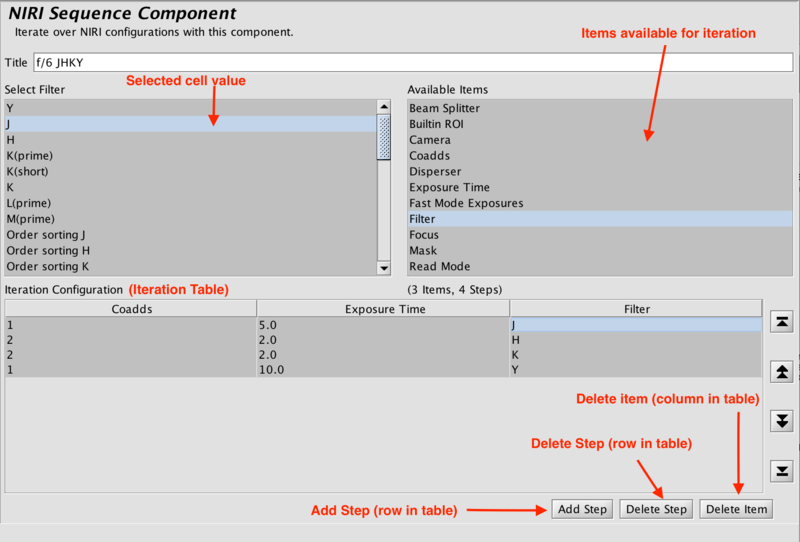 When a cell is selected, the available options for its value are displayed in the box in the upper left-hand corner. For example, when a cell in the filter column is selected, the available filters are entered into the text box. When a cell in the integration time column is picked, the upper left-hand corner displays a text box so that the number of seconds can be entered.